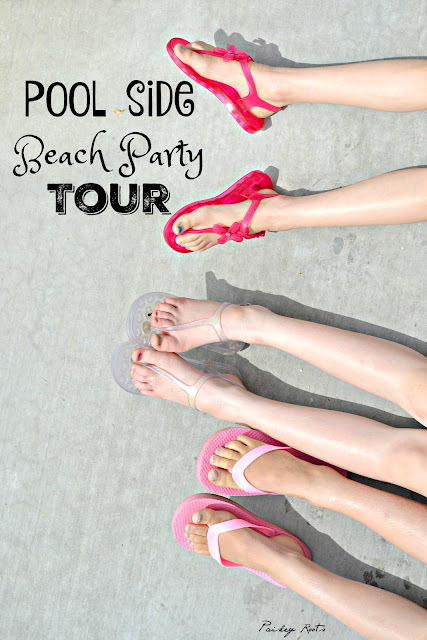 It's a Pool Side Beach Party! Like any awesome party, we have prizes and of course will be showing off our swimwear, so grab a coconut and a nice shady cabana by the pool, and join in the fun! My kids are water babies and are always playing with water. It drives me nuts! But I do get to make them swimsuits and I'm pretty sure that out of everything I make them, swimsuits are the most beloved and worn. And that's saying something. 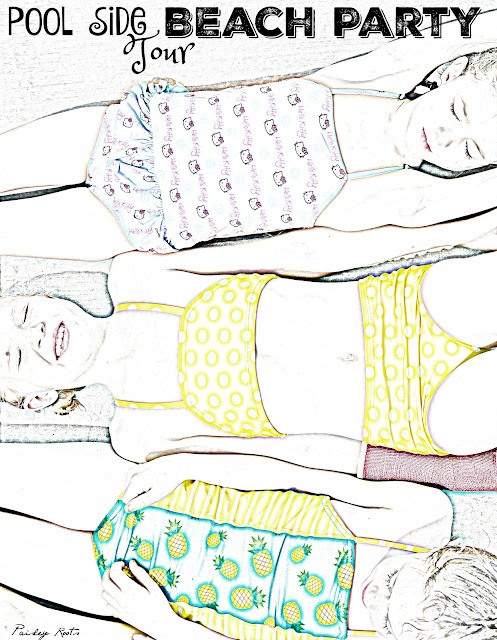 I'm only *slightly* obsessed with the Cosi swimsuit by Sewpony Vintage and we made one for each girl. 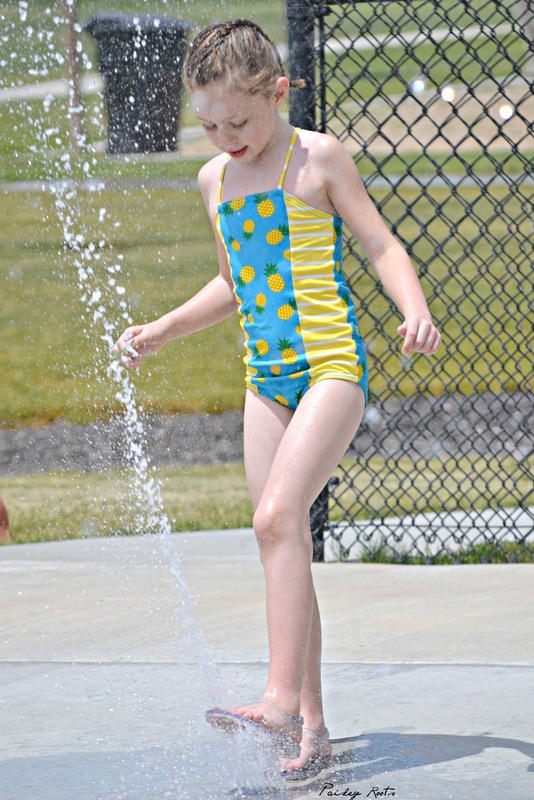 This is the third year in a row we've used it for our swimsuits. It just has so many variations and cool looks, I'm sure we will be making them for quite a few more years to come! So here's the low down on each swim suit. This was supposed to be for Paisley, hence the "itsy bitsy" top....BUT it is an "itsy bitsy, teenie weenie, yellow polka-dot bikini"...sooo...it kind of works. I was seriously dying with how determined this chicken was being that this bikini was hers. The bottoms fit her perfectly, but we'll be making a rash guard soon. 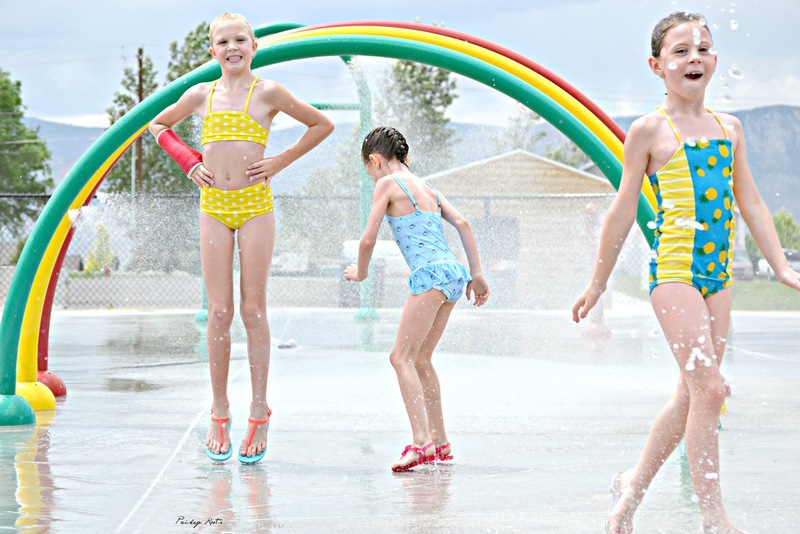 The yellow polka dot swim is from Peek-a-boo Fabric Shop. I got it in a grab bag and as soon as I saw it I knew it was destined to be turned into a bikini. This is the view G option of the Cosi, just without the frills. Paisley wanted view D and chose the Hello Kitty Swim fabric that we bought a couple years ago from The Fabric Fairy. She absolutely loves the little tutu skirt. For these suits I went all out and got swim elastic and wooly nylon thread. 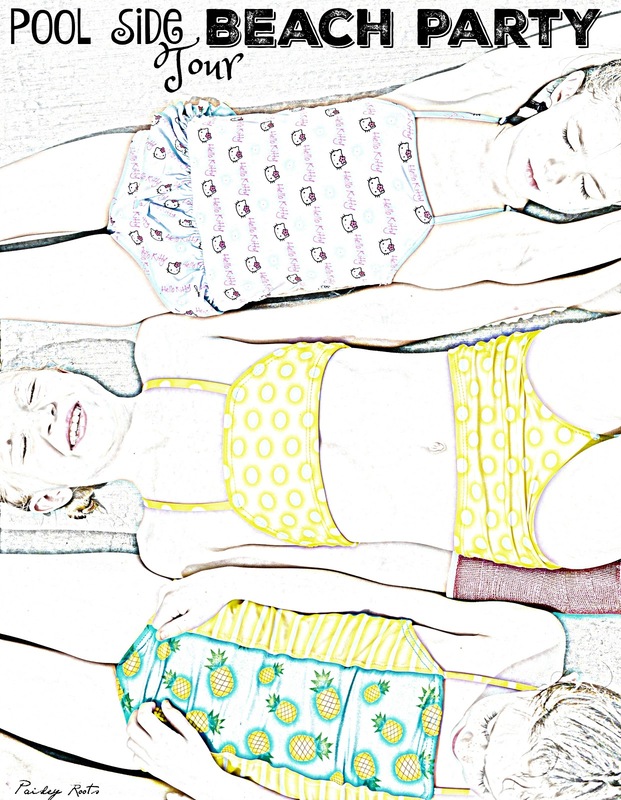 Not that regular elastic and thread weren't working in our past swimsuits, but since these guys are all enrolled in swimming lessons and will be spending more time in an actual swimming pool this year, I wanted to make sure I did it all the right way. Make sure to hit all the stops on this party! I may also add that I am soooo grateful that casts have come so far and now are water proof. That girl can swim anywhere with that thing. Only two more weeks left and she's a free armed kid! And now onto all the goodies of the party! Happy Summer! LOVE those suits. 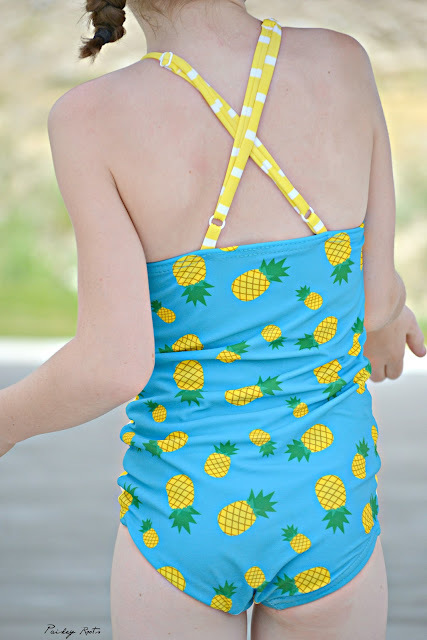 I have been eyeing Peek-a-boo's swim fabric since they launched it but haven't ordered any yet. That pattern looks great with so many different options for all three girls! What sweet suits on your adorable girls! NONE of the suits look hand-made and that's definitely a sign of a talented seamstress! 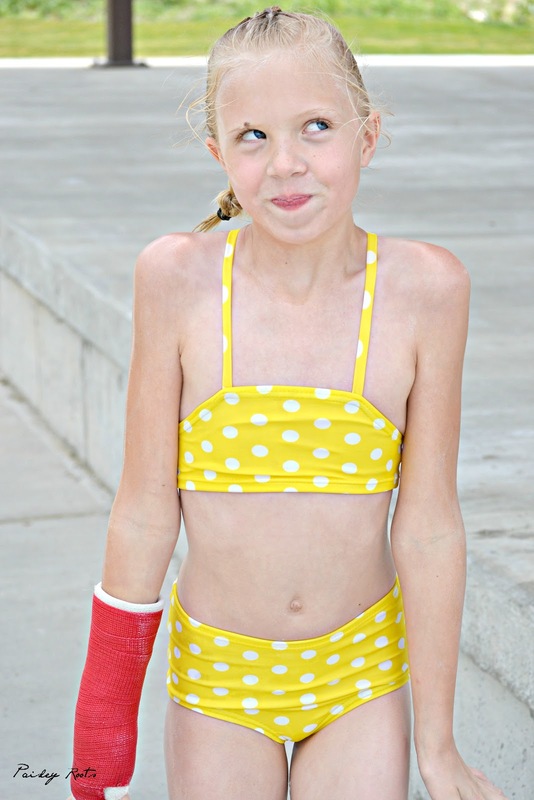 I agree that the yellow polka-dot fabric was just screaming to be made into a bikini. Great work! Love the skirt on the Hello Kitty suit... But my favorite is the pineapples and stripes! I'm so impressed by your suits! I always love your suits, but your STYLO pineapple will always be my favorite. You are my spandex hero. Those yellow dots are amazing! Such cute suits all around! Lovely suits! What is this rash guard of which you write? I love all the suits! 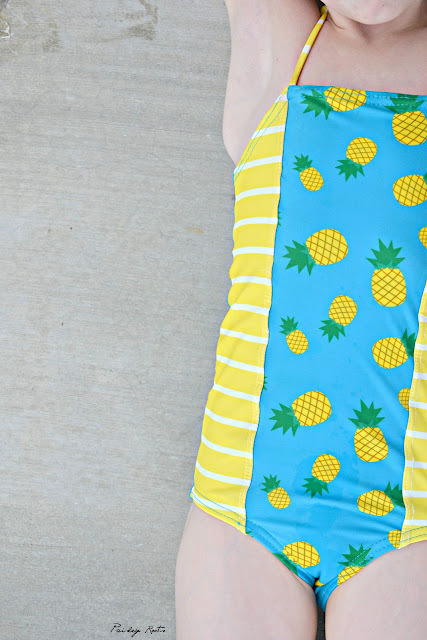 That pineapple fabric is awesome!